For its first launch of 2019, Arianespace will orbit two telecommunications satellites using an Ariane 5 from the Guiana Space Center: Saudi Geostationary Satellite 1/Hellas Sat 4, a condosat for KACST and Hellas Sat; along with GSAT-31 for the Indian Space Research Organisation (ISRO). Through this 103rd Ariane 5 mission – the 70th with an Ariane 5 ECA version – Arianespace confirms its leadership in the geostationary launch services market segment. Flight VA247 will be performed from Ariane Launch Complex No. 3 (ELA 3) in Kourou, French Guiana. 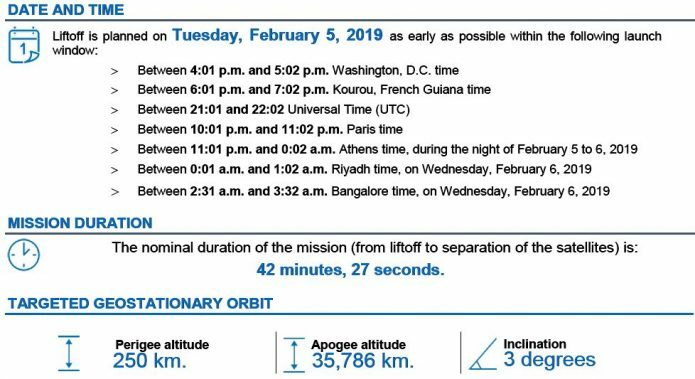 The Launch Readiness Review (LRR) will take place on Monday, February 4, 2019 in Kourou to authorize the start of operations for the final countdown. Composed of two payloads, Saudi Geostationary Satellite 1/Hellas Sat 4 also called HS-4/SGS-1, is a geostationary condosat for KACST (King Abdulaziz City for Science and Technology- Saudi Arabia) and Hellas Sat (Greece – Cyprus) which aims at providing telecommunications services in the Middle East, South Africa and Europe. The Saudi Geostationary Satellite 1 communications payload will provide advanced Ka-band spot beam communications services for the Kingdom of Saudi Arabia’s KACST, including secure communications for the Gulf Cooperative Council region. The Hellas Sat 4 communications payload, on the other hand, will offer advanced Ku-band regional beam communications services for Arabsat’s subsidiary Hellas Sat, a Greek-Cypriot satellite operator which provides services to leading Direct-to-Home (DTH) operators by delivering contents to more than three million households. The HS-4/SGS-1 satellite was designed, assembled and integrated by the U.S. manufacturer Lockheed Martin Space. GSAT-31 is a telecommunications satellite designed and manufactured by the Indian Space Research Organisation (ISRO) which will provide communications services in Ku-band for at least 15 years. GSAT-31 will essentially help bridge the digital divide in the Indian subcontinent as part of an ambitious Indian space program, whose objectives are to develop India while pursuing science research and planetary exploration. To watch a live, high-speed online transmission of the launch (including commentary in French and English from the launch site), go to arianespace.com or to youtube.com/arianespace on February 5, 2018, beginning 20 minutes before liftoff. Arianespace uses space to make life better on Earth by providing launch services for all types of satellites into all orbits. It has orbited more than 590 satellites since 1980, using its family of three launchers, Ariane, Soyuz and Vega, from launch sites in French Guiana (South America) and Baikonur, Kazakhstan.